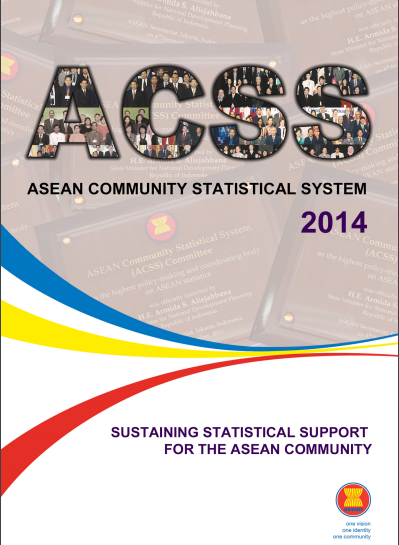 Introduction: Following the establishment of the ASEAN Community Statistical System in 2011, this publication chronicles its achievements to date and highlights its valuable contributions to ASEAN’s Community building efforts. This builds on the first publication The ASEAN Community Statistical System: A Stronger Mandate on ASEAN Statistical Cooperation, which presented the mandate, role and responsibilities of the ACSS Committee, the National Statistical Offices, and the ASEAN Secretariat’s ASEANstats. For the past three years, efforts are focused on strengthening the institutional framework, both at the regional level and with the National Statistical Systems. Official documents have been adopted aimed to promote coordination, harmonisation, data sharing and dissemination of ASEAN statistics, which are also included in this publication. The ACSS Strategic Plan 2016-2020 has just been adopted to ensure the sustainability of statistical development in the ASEAN region, further contributing to the data and information needs of the ASEAN Community. As part of our continuing efforts to strengthen regional cooperation and engagement with external parties in the development and enhancement of the ASEAN Community Statistical System by 2015 and beyond, may this publication serve as a useful reference for stakeholders and users of ASEAN statistics.